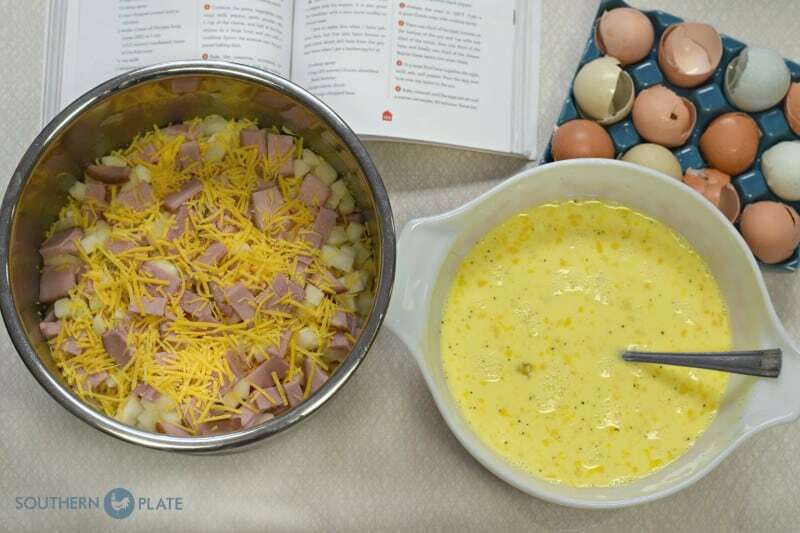 At the bottom of this post for Sausage, Egg and Cheese Casserole are instructions on how to make this in an oven and traditional slow cooker (crock pot) as well. Hey friends! Today I’m sharing a recipe from my second book, Come Home To Supper (page 155). This is a favorite for a protein rich supper, weekend brunch, or breakfast for a crowd – Christmas and Thanksgiving morning will be here before you know it!. I’m using my Instant Pot for this, however it is a slow cooker or oven recipe as well. Instructions for the different cooking methods are in the printable recipe at the bottom of this post. I’ve had tons of people ask me for Instant Pot recipes since I first mentioned having one. The thing is, you don’t have to adapt your recipes to cook them in the Instant Pot, because the Instant Pot adapts to your recipes. I feel like that is the whole point of it’s convenience, you can cook your favorites faster and more conveniently. So rather than show you recipes developed especially for the instant pot, I plan on showing how I use Instant Pot. Today, I’m using it as a slow cooker. This is handy because it is already sitting on my counter and that stainless insert is going to go right into my dishwasher when I’m done. 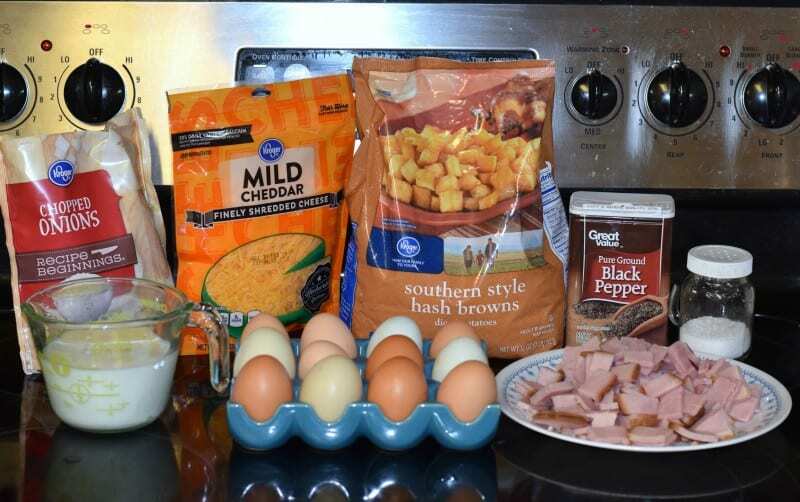 To make this, you’ll need: Onion, Shredded Cheese, Frozen Cubed Hash Browns, Chopped Ham, Cooked and Crumbled Turkey Breakfast Sausage, Milk, Eggs, Salt, and Pepper. You can chop the onions yourself and shred the cheese if you like but I just love buying these frozen chopped onions for a great short cut on the days when I just want to make my life a tiny bit easier. There are so many things we can’t ease up on, so sometimes a little thing can give us great comfort :). Special Note: We no longer eat pork but this recipe is wonderful with cooked, crumbled turkey breakfast sausage. I recommend Jenn-O brand because that is our favorite. Layer 1/3 of potatoes, 1/3 of onions, 1/3 of ham, and 1/3 of cheese in your insert. Repeat this two more times until it is all used up. Beat eggs, milk, salt, and pepper together and pour over layers. Now, the instant pot has several settings. As I said before, I’m just tossing all this in and using the slow cooker setting. I press “Slow Cooker” and then press “Adjust” until it goes to the “less” light on the display screen. I now have it slow cooking on low. From there I use the plus or minus sign to move this up to seven hours. If you want to cook this on high, just press “slow cooker” and it is automatically on high. Then adjust your time to anywhere between 3-4 hours. You could probably adapt this recipe to be a pressure cooked one but I usually reserve pressure cooking in my instant pot for roasts, chickens, stews, dried beans, boiled eggs, and potatoes. Oh I have GOT to show you this potato recipe – you will love it. I’ll try to get it photographed this weekend. Servings: 5 -6 meal sized servings, 8-10 side size servings. All yields are approximate. Spray the insert of a slow cooker, instant pot, or 5 quart dutch oven with nonstick cooking spray. Place 1/3 of hash browns in bottom. Top with 1/3 onions, 1/3 ham, and 1/3 cheese. Repeat two more times. In large mixing bowl, beat together eggs, milk, salt, and pepper until well blended. Pour over ham and potato layers. To make in an oven: Bake, uncovered, at 325 for 90 minutes, or until the eggs are set. To make in a slow cooker: Place crock in slow cooker, cover with lid, and bake on low 7-8 hours or high, 3-4 hours. To make in anInstant Pot: Place insert in Instant Pot. Press "Slow Cooker", then "Adjust" until the light comes on under "less", adjust time using plus and minus sign to get it to 7 hours. If you'd like to cook it faster, press "Slow Cooker", don't adjust to less, then adjust time to 3-4 hours. See the Instant Pot I have by clicking here. I am thinking about doing a low carb version with broccoli in place of the hashbrowns. Have you tried any low carb variations? I think broccoli or even just a bunch of chopped bell peppers would be really nice. Also you might want to use heavy cream in place of the milk, maybe 1/2 cup heavy cream and 1/2 cup water, that is if you are eating LCHF. Could you omit the hashbrowns altogether and not use anything? I am eating LCHF but don’t want to put broccoli in. If you haven’t tried the riced cauliflower it is a great sub for anything calling for potatoes. I use also in place of grits. Cauliflower is turning out to be one of the wonders in my kitchen. I’m amazed at how versatile it is! Is it just my imagination, or do you have a green egg layer out in your coop? We have one Easter Egger that does. Yes! We have two Easter Eggers, one lays blue and the other green 🙂 LOVE My hens! Hi Christy. My question is about the Instant Pot; although, I do want to try your recipe (it looks delicious). I want to purchase an Instant Pot; however, it looks threatening. I know very little about pressure cookers. Is it easy to figure out? Also, every time I make a dish similar to your Ham, Egg, and Cheese Casserole, whether in the oven or crock pot, it literally burns the outside and the inside is dry. For that reason, I have stopped making them. Does that happen in the Instant Pot? Sorry I forgot all my words, just check it in 15 mins. and see how it’s doing. If it needs longer do five minutes at a time until it’s done. Hi Tammy! My crock pot has a dark insert and I always cook it on low. Whenever I made it in the oven I would use a clear 9×13 baking dish. I am thinking that maybe I should cook all the ingredients except the hash browns and eggs before assembling and baking. Any thoughts? Thanks. I love short cuts when cooking but I never put my onions or potatoes in the fridge or freezer because that cold temperature converts the starch to sugar. I am aware that you limit sugar in your diet and hope this suggestion will help you in doing that. I love your recipes and stories. Hmmm. Nope. Science is a wonderful thing to learn. I’m so excited you have an instant pot!! It’s my new favorite time saver!! I have recently made your chocolate cobbler in it! And you are right, it adapts to you!! 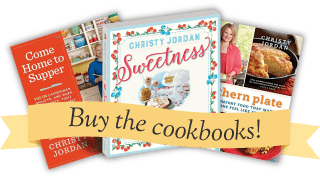 Jennifer or Christy….where can I find the chocolate cobbler recipe? I didn’t think I ever missed your posts, but maybe I missed that one….just love all your recipes and posts. I’d love to know how this was converted for the Instant Pot. I just got one and I’m not intuitive when it comes to converting my own recipes. Thank you!! I have made this in my crockpot for a youth Disciple Now weekend and it was a huge hit! I threw it all in the crock pot around midnight — we hosted the girls and stayed up a little late. it was perfect by breakfast. I offered tortillas and hot sauce (for the guys). The crock pot was scraped clean and the youth preferred it over all the other breakfast goodies. Thanks for posting this yesterday! We are having our daughters and their families home this weekend and this will be our Sunday AM breakfast before church!!! Now I can help get the granddaughters ready and visit instead of be in the kitchen! how big of a crock pot, christy? Do you just use the lid that came with the instant pot when you use it as a slow cooker? is used when slow cooking. I would love to know if this can be converted to the quick pressure time too! So I played around with this recipe and finally came up with this: I used an oven safe bowl that fit inside my IP and sprayed it with cooking spray. I added a cup of water to the IP, halved the recipe and loaded up the bowl (you could also do mason jars and fill multiple ones) and set it on a trivet inside the IP insert. I pressure cooked on high for 12 minutes plus 5 minutes of natural release. It came out great. I added salsa and sour cream and it was a family hit. Have you made this in your Instant Pot slow cooker yet? How did it turn out? Have you done any other Instant Pot recipes? I was so looking forward to this recipe but I just woke up to an instant pot breakfast failure. 🙁 I followed the recipe exactly but ended up with a super wet (still not sure if it’s underdone eggs or water from the hash browns) casserole that burned to the bottom of my instant pot. If I try it again I might try it in an actual slow cooker instead. I had almost the exact same problem. After 7 hours on low in the Instant Pot, the bottom third was cooked and starting to brown, but the rest of it was like soup. I had the same problem. I’m hoping it will turn out by manually cooking for 30 minutes after cooking on slow cooker for 4hrs on high. This took a little longer in my instant pot, set it for 7 hours on low, checked it around 6 and the eggs were still completely wet. Turned it up to high at this point, at 7 hours the eggs were still pretty runny. So next time may try setting on the med setting for 8 hours. Also used frozen potatoe obrien (diced potatoes, green peppers, onions) instead of just hash browns because they happened to have these at Aldis this week. Was very yummy when it was finally done, some of us made breakfast burritos by just filling tortillas & topping with salsa, super yummy! Do you think I can cut up my own potatoes for this recipe instead of using frozen? Or will the cook time be too long for nonfrozen potatoes? Thanks! You can cut them but if blanch them a bit first so the dish is done in time. The eggs cook pretty quickly. If you double the recipe, do you have to adjust the time at all? Thanks! Have you ever tried this with cooked sausage instead of ham? I’m thinking of trying it. It would work wonderfully. I’ve made it lately with turkey sausage. My dear friend, Kat, used this recipe with turkey sausage for a Craft Guild Mothers Day Brunch. She cooked it overnight in a crock pot and it was wonderful.AND SO EASY! Is there a high pressure way to cook this? Not using the Slow cooker function? Christy, I tried your recipe today in my instant pot for 4 hours and my eggs didn’t set? Wondering what I have done wrong? Do I need to use a different lid like the glass one? I had the same problem tonight. Nowhere close to being done. I’ve made this in the oven and it turned out great. Will have to keep doing it that way from now on. 7 hours in the IP? Is that a typo? Nope. That’s correct. 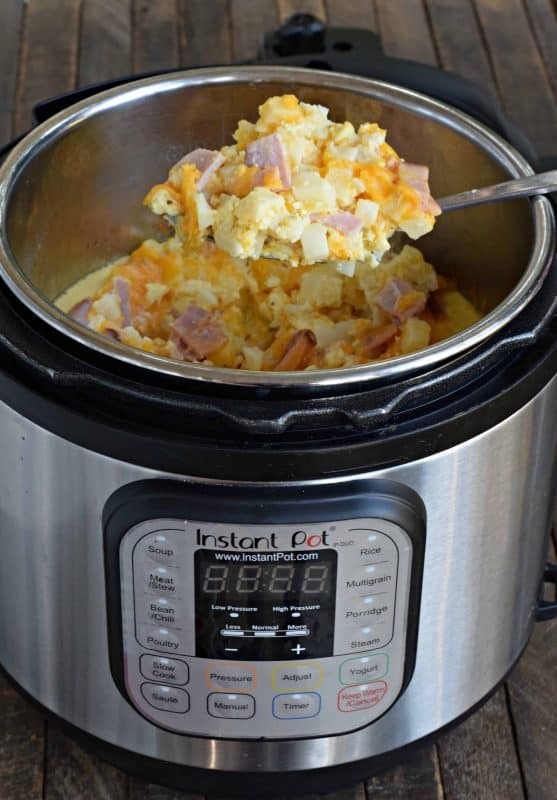 If you have time please read my post where I talk about how the instant pot is designed to be many appliances in one and then you’ll note that this recipe has you using it as a slow cooker. I’m thinking you’re thinking of it being a pressure cooker only in this case. There were several questions asking if this could be cooked under pressure. I have read in several blog posts and maybe even in the manual that dairy will curdle under pressure. I would stick to using the slow cooker function of the instant pot for this recipe. Also, if you use the lid that came with the instant pot to slow cook, make sure the pressure value is set to venting. Came out great! A little brown on the edges just right! Top with salsa for a little zing! This didn’t cook well in either a crockpot or an instant pot (I made it in both for s party) thank goodness I made other food as well because this tasted like nothing. Don’t waste your time making it. I’ve never commented on a blog before, but this was bad enough to compel me. I cooked this recipe in my Instant Pot for 7 hours on low Slow Cooker and the eggs were still runny and the frozen potatoes were crunchy. So I cooked it on high for 2 hours and it’s still sort of soggy. I’m going to transfer it to a pan and cook it the oven. What’s the consistency supposed to be like when cooked in the Instant Pot? It’s nowhere close to browned. Can this be made with egg beaters? Could I use shredded hash browns instead of cubed? I noticed that some say this can turn out soggy, so I’m wondering if you thaw your hash browns and then squeeze out all the liquid if that might help. Any thoughts? I think that might would work. If you give it a try I would love for you to come back and let me know how it turns out.